This book is a real treat for Crumb fans, but it holds possibly even more promise to record buffs and collectors who have yet to be hepped to Crumb's vision. A clever package mimicking the classic tan 78rpm record sleeve from which the glossy, black hardcover volume is extracted starts things off on the right foot, and the collection begins with an archetypal R. Crumb 1-page autobio strip about his record collecting obsession before moving on through page after page of great artwork produced by Crumb for record covers of all sorts, but most of his favorites in the world of "old-timey" music of the past and recreated in the present (often by a band including Crumb himself). The artwork appears in both full color reproductions and black and white, from a variety of sources. Included here are several full color reproductions of Crumb's original black and white artwork, allowing for a meticulous examination that will be an extra treat fro Crumb fanatics. Publisher W.W. Norton sez: "A landmark work that pays splendid homage to a forgotten era of seminal American music. Robert Crumb first began drawing record covers in 1968 when Janis Joplin, a fellow Haight Ashbury denizen, asked him to provide a cover for her albumCheap Thrills. It was an invitation the budding artist couldn't resist, especially since he had been fascinated with record covers-particularly for the legendary jazz, country, and old-time blues music of the 1920s and 1930s-since he was a teen. This early collaboration proved so successful that Crumb went on to draw hundreds of record covers for both new artists and largely forgotten masters. So remarkable were Crumb's artistic interpretations of these old 78 rpm singles that the art itself proved influential in their rediscovery in the 1960s and 1970s. Including such classics as Truckin' My Blues Away, Harmonica Blues, andPlease Warm My Weiner, Crumb's opus also features more recent covers done for CDs. 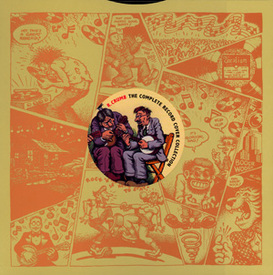 R. Crumb: The Complete Record Cover Collection is a must-have for any lover of graphics and old-time music." If you have five minutes to spare check out this book's official "TRAILER" on YouTube.